This special pass allows you to try out various teachers and styles to find and tailor a practice that works for you! This offer is for new students only, and may not be combined with other discounts. Redeemable for all our drop-in classes, and excludes series and workshops. Pass activates at time of purchase. Autopay*, $125/month 30-day months, minimum 3 months; To sign up for Autopay please visit our studios in person. Note: Receive 20% off class cards and membership options if you are a student, preschool through high school teacher, current or former military personnel, a senior, or work for a small non-profit. (ID required, not to be combined with other discounts or the New Student 3 Week Special.) This does not apply towards series or workshops. NEW! 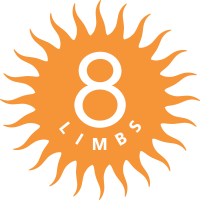 Access 8 Access 8 is one of the ways we’re committing to making yoga more accessible. If paying full price for classes is not financially viable for you, we invite you to reach out to access8@8limbsyoga.com to inquire about income-relevant tuition options and scholarships. We reserve the right to change our rates and discounts at any time.